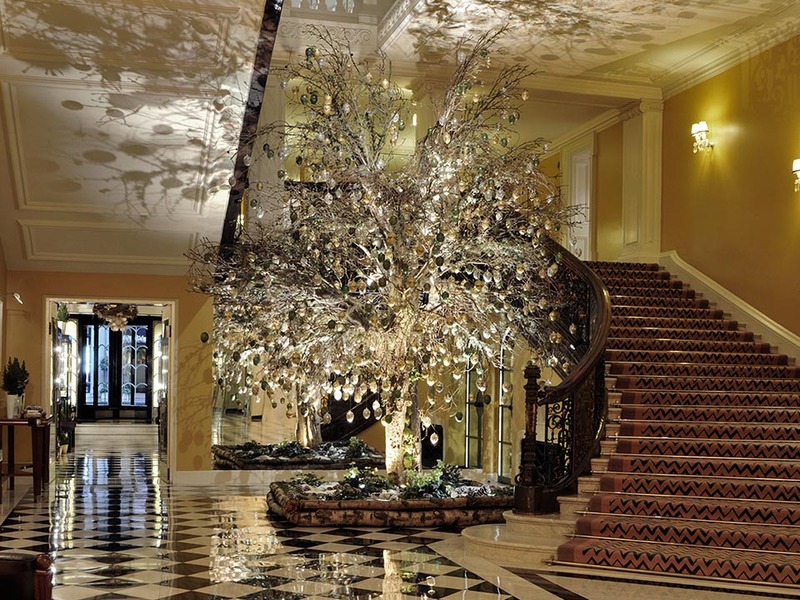 Claridge’s has a new Christmas tree and everyone’s going wild for it. Which is little surprise as, firstly, it’s designed by Diane von Furstenberg, so it’s pretty much guaranteed to be a design classic straight out of the box. Secondly, it’s actually quite beautiful. 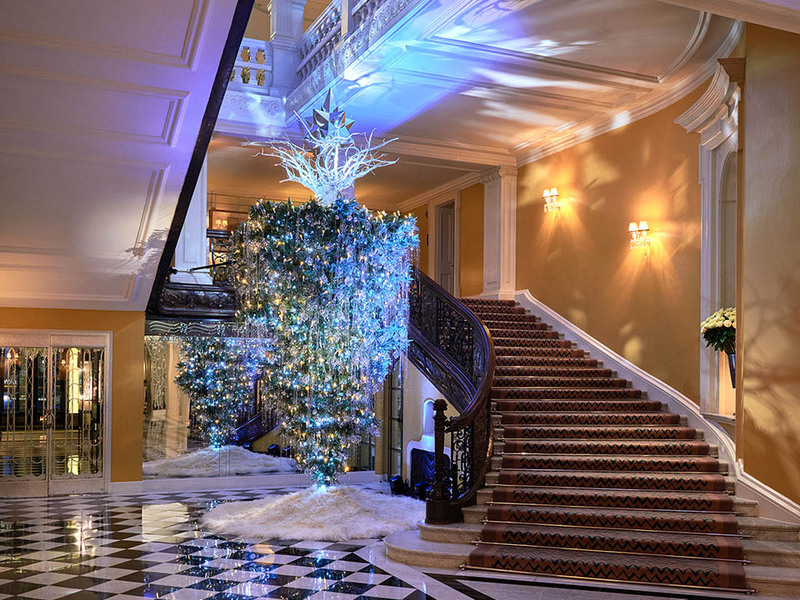 But most importantly, it’s the Claridge’s Christmas tree, and the Claridge’s Christmas tree is always, like, a thing. Like always. Plonked in the middle of the hotel’s foyer, in the arc of the grand staircase, the official plonking ceremony takes place at the end of each November, and it consistently reveals something special. So we’ve taken a moment to whisk you back over the years to see legacy von Furstenberg’s continued in 2018. So the first thing you’ll probably notice is that it’s not exactly a Christmas tree in the true conifer sense. But then it’s not got tinsel or a fairy either, so perhaps we’re on an artistic plane above all that. The tree, dubbed ‘Tree of Life’, is surrounded by a number of sculptures, a dear representing gentleness, a peacock for beauty and a sleeping mouse, meant to symbolise curiosity (we had mice once, they got curious in my jumpers’ drawer so I poisoned them all. I think von Furstenberg and I may have a different approach to mice). There’s an owl in there too. 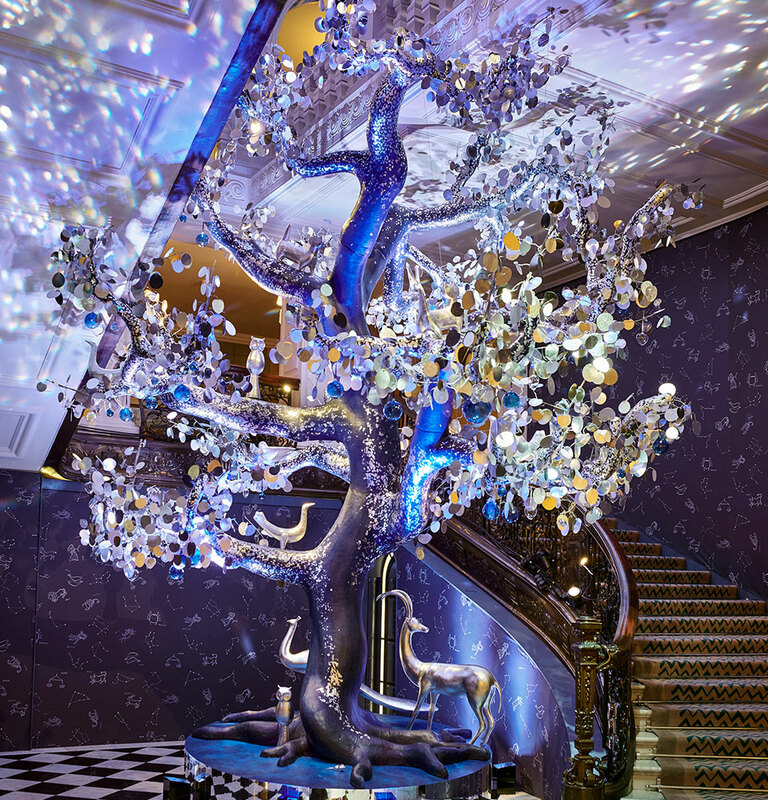 The 18-foot sculptural tree has an eery blue iridescent lustre and shimmer (a bit like the loos in McDonald’s), and the beauty continues across over 8,000 hand-painted silver-leafed leaves, glass spheres and 150 hand-blown glass hearts. It’s a stunner. But what about the trees that went before it? So this one is my absolute favourite, because it’s a Christmas tree, but upside down. Even my limited artistic appreciation gets that. The creation of fashion world icon and oddball Bond-villain Karl Lagerfeld, 2017’s tree was spectacular. Apparently inspired by Lagerfeld’s childhood memories (presumably he grew up in Australia), the 16-foot inverted tree, roots and all, was topped off with a large mirrored star while sheepskin rugs (Icelandic, no less) were strewn at the base to suggest recent snowfall. Love it, but don’t try this at home unless you want to spend December hoovering up pine needles. Jony Ive is the Chief Design Officer at Apple and has basically designed everything from your laptop to the phone in your pocket so when he stepped forward to design the Claridge’s tree presumably there was only one stipulation: make sure the battery doesn’t randomly die at around 4pm. A collaboration between Ive and Marc Newson, along with set designer Michael Howells, they created more than just a tree, but an immersive experience. Their series of 12-foot high light boxes, along with cast models of Scots pine was innovative and incredibly pretty. 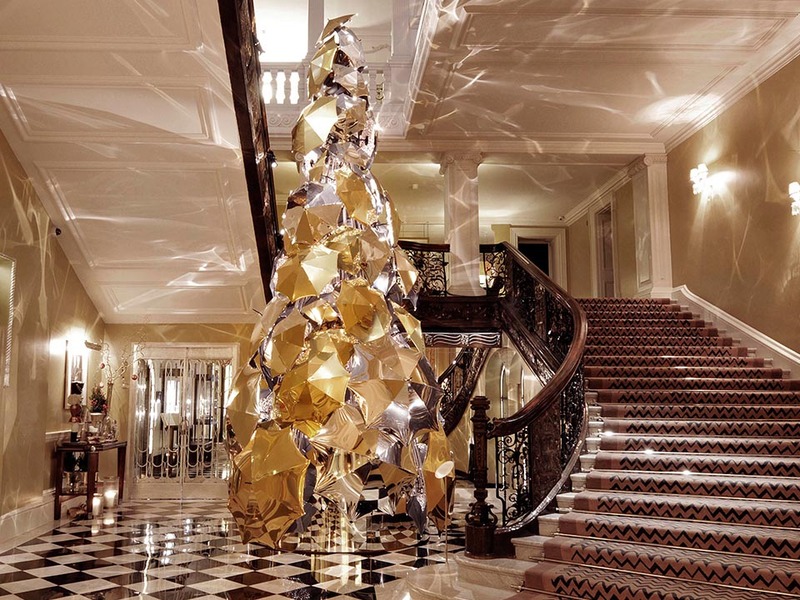 Despite being a British institution, until 2015 Claridge’s hadn’t had their tree designed by a British designer yet (this is their line, at least, but seems to overlook John Galliano, perhaps it’s because he did it for Dior). Either way, they put that all right by bringing in mac specialists Burberry, and their then-CEO Christopher Bailey. The man credited with taking the British brand global celebrated our culture in the only way possible: with brollies. 100 of them, each one finished in bespoke gold and silver metallic fabric. And excitingly (geek alert) each one was laden with thousands of motion-sensor lights, each programmed to sparkle as guests walked by. Pretty cool, huh? Finally, a proper tree, am I right? 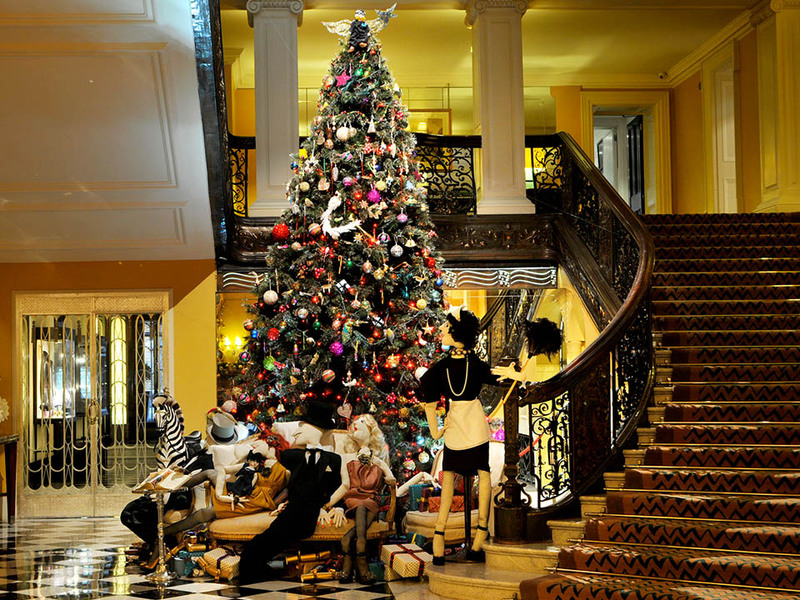 This time Dolce and Gabbana were taking on the Claridge’s Christmas Tree mantle. Proving they had a far less disturbed childhood than Karl Largerfeld, the tree was inspired by their childhood memories and aimed to celebrate ‘children of the world’. 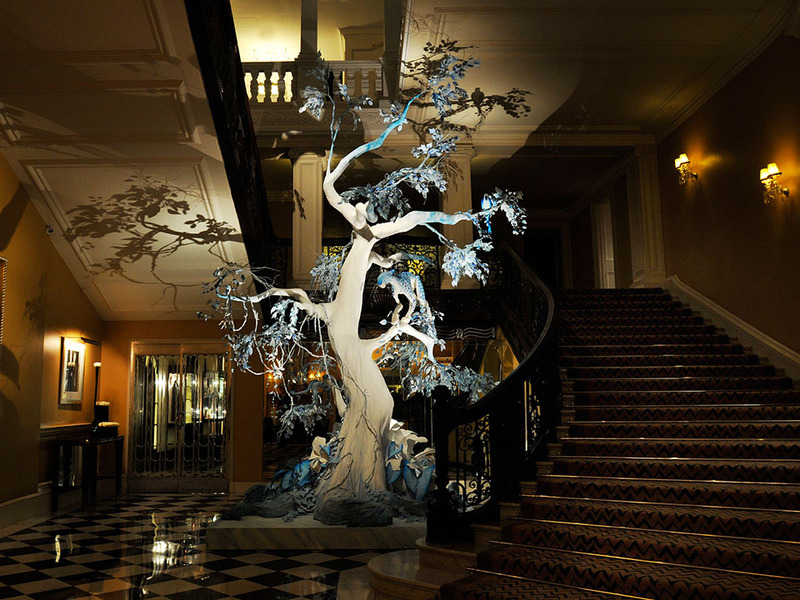 Kally Ellis of McQueens was responsible for “Forest Murmurs”, a rather exquisite tree. The creation featured magnolia branches and lichen moss and was studded with crystal and emerald jewel eggs in white, gold and silver which was meant to reflect the art deco beauty of the iconic hotel. 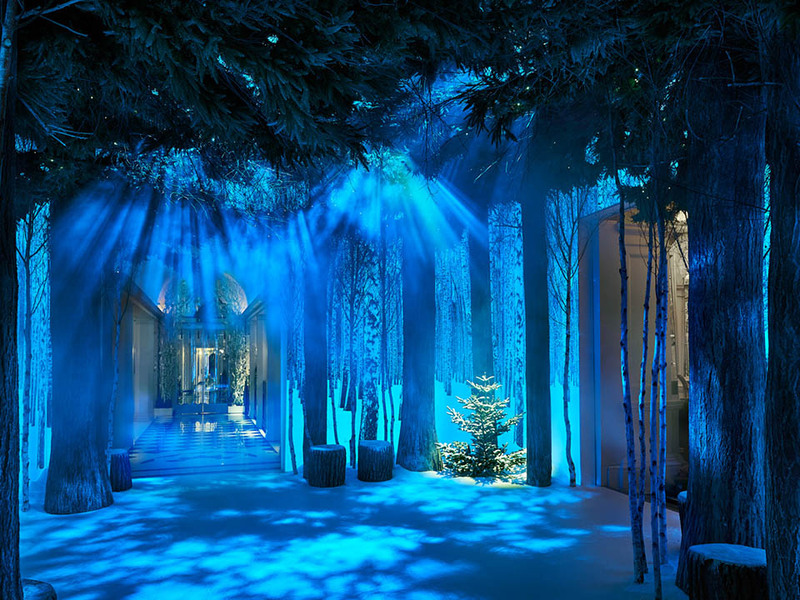 The former creative director at Lanvin put together 2011’s tree, intended as ‘a dreamworld of colour and fantasy’ (isn’t that all Christmas trees?). Perhaps the most bizarre aspect was the traditional angel, which wasn’t very traditional at all but instead Elbaz had, rather humbly, substituted it for a silk figurine of himself, complete with his trademark bowtie and glasses. And this is where it all began. 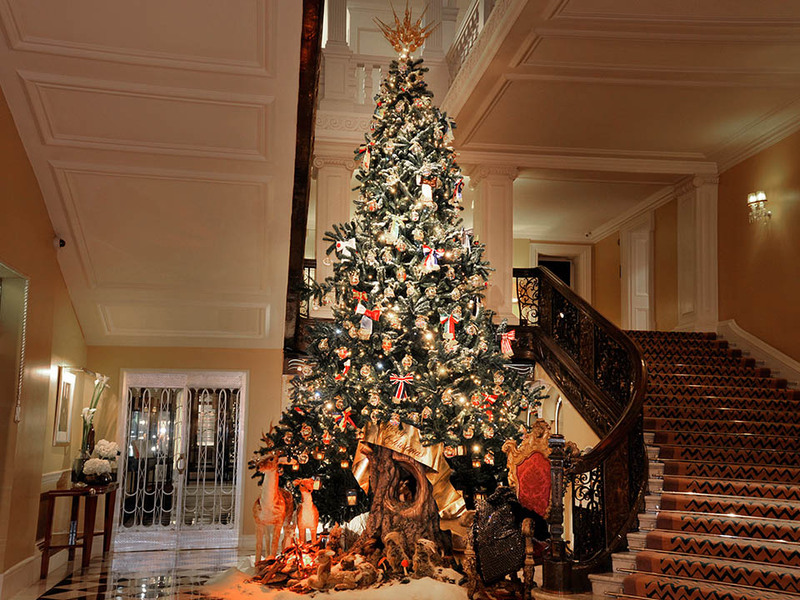 2009 was the first year that Claridge’s had decided to go with a famous designer for their Christmas tree. They plumped for Dior’s star John Galliano who set the standard that subsequent designers would follow. His haunting twist on tradition was a tropical tree along with a snow leopard, dragon flies and parrots, which, according to Claridge’s website, is ‘echoing Claridge’s art deco surroundings’. Not sure how many snow leopards are prowling round the hotel. This entry was posted in Latest News, London and tagged alber elbaz, burberry, Christopher Bailey, dolce & gabbana, DVF, Karl Lagerfeld, lanvin, MARC NEWSON, SIR JONY IVE. Bookmark the permalink.